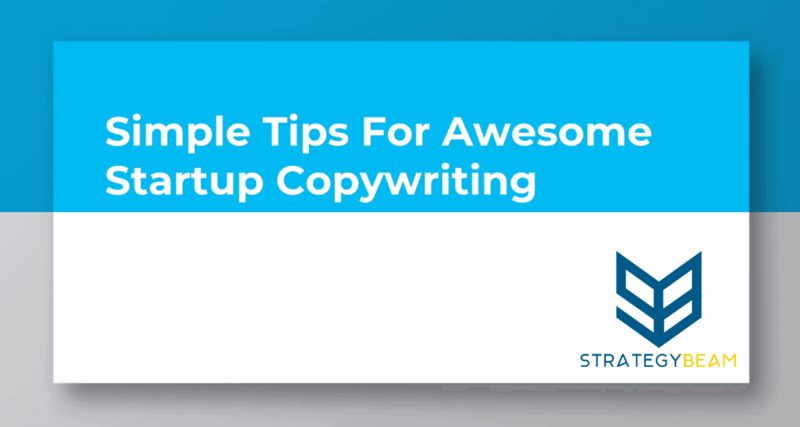 Today we’re going to take a look at some simple tips for awesome startup copywriting. These tips will help you drive qualified leads to your site and boost conversions with proven Internet marketing strategies. The first thing that we need to remember is that as you as you begin your startup experience, you’re an entrepreneur and you want to fulfill the needs of your customers. These requirements are out there, but supply is not there. That’s why you’ve started your business. The only way to write great copy is to understand who your audience is. Since you’re just starting out you’re going against large companies that have millions of dollars to spend on content and have thousands and thousands of pieces of content in their archive that you’re competing against. The best way to do this is to start small and niche out and focus on your audience. Your audience is pretty significant because they’re the ones who are going to be paying you. How do you focus on your audience? Well, you could do your audience customer research, and once you understand your audience, you need to be relevant. You need to be showing specific information for specific needs because your startup is not as large as your competition. You need to be trying to alleviate a specific problem or pain point that your audience has. The next part of writing great content for your startup is consistent. Your startup is just launching, so you haven’t developed a brand yet. Being consistent in both the visuals and copywriting is essential because this is where you set the tone for your audience to understand what they’re walking into every time they interact with your online marketing content. The third part is that your content needs to be consumed quickly by a lot of people. Even with very technical startups try to go a little above and beyond with weighty and dense content. While it is OK to showcase your knowledge, it’s much better to produce your content so your audience can consume that content easier. Consider that the majority of your consumers are coming through mobile and tablets. If you’re not producing content that’s quickly consumed on mobile and tablets, then you’re going to be losing out on about 60% of your audience. As a result, your startup will see less qualified traffic. In turn, this means fewer sales for your business. Focus on how to make your content can easy to consume, and we’ll talk about that a little bit. Then you want to optimize your content to get found by search engines and people. We talked before about making content optimized for the devices that your audience is consuming your content. You also need to optimize your content to be found by Google because when people go to Google, they’re asking questions. Google can’t send people to your site if Google doesn’t know how to understand and contextualize what’s on your pages. Approaching your content by balancing the needs of your audience and demands of Google will improve your SEO marketing strategies for your startup website. We’re going to look at how to drive qualified leads to your site through optimized content. The best way to focus on your audience is to use customer interviews, market research tools user, and surveys. Other tools can be utilized to get first-hand, and third-hand insight on who your customers are because the more relevant, consistent and consumable your content means the better you’re going to be found online. Everything that you write about for your startup needs to be benefits and results. It’s not all about features. Many startups just focus on the elements of their product and miss opportunities. Nobody cares about your product because they only care about the benefits for them. How will it improve their lives? Every time somebody purchases from you the benefits and results of that acquisition outweigh the cost of that investment. That fact leads to value. Your customers care about the importance of your product or service, and value is summed up by either saving time or saving money. As you begin to write excellent copy for your startup make sure that you’re you’re showing how your product saves time or money. That’s a pro tip that I started using, and I’ve been seeing a lot of results in my projects and client content. How can you show that? Well, make sure that you focus your content on explaining how you improve their lives, and you help achieve their goals. Always tailor your content to your readers. Remember, going back to the first step and the first slide is that understanding your audience is crucial. Your startup needs to niche out your audience and niche out your content. Even if it’s a smaller group, it’s better to get 12 people buying from you out of 24 people than one person out of a thousand. The third part of creating excellent SEO copywriting for your startup is that we need to optimize content because your content needs to be found online. You can make the best content in the world and have the best product, but if no one can see your content then it doesn’t matter, and you won’t make money. As a result, you won’t be in business for long. Part of your startup marketing plan needs to be centered around getting found on Google. How do you do that since search engines are mainly driven by text-based content? Right now using the right keywords is a huge part of this and that’s keyword research you could use paid or free online marketing tools like SEMrush and Ahrefs. You can also find this information by going through forums to understand what people are looking for and then use those exact phrases in your content. This approach will optimize your content, so when people go to a search engine, and they type a phrase into Google or Bing, that exact phrase shows up. Then Google or Bing will understand the needs of your customers and align that question with your answer. Optimizing your content is not enough because you need to format your content to be read. About 60% of your traffic is going to come through mobile. Don’t be mobile-ready or mobile-friendly. You need to be mobile-first! Many people, including myself back in the day, spend more time writing content and less time promoting it. You can have the best content in the world, but if no one reads it, then no one can take action. No one could give you their money, and that is trouble for your startup. Spend about 20% of the time producing and 80% of the time promoting. Some actionable tips we just looked at how to format and the need to do like keyword research. Let’s not just leave it at that let’s see how we can make this happen for your startup copywriting. Have about 2 to 3 sentences per paragraph this means that it’s not going to be too long nor too short and it also gives us enough space to build it out with those keywords to optimize. The second point is to bold significant term. What this does is it helps draw a reader’s eye to specific times of your choosing, and it also helps to break up long text blocks. While we’re on the point of breaking up large text blocks, always remember to use bullet points when possible. Formatting your content for mobile is critical, and bullet points break up the text and help people understand. This results in a material that is quickly consumed for the length of your content. You always want to have it about 1,200 to 1,500 words. This usually gives it a large enough canvas for you to optimize your content without having to keyword stuff your content. It also helps with ranking your information in search. Since in the English language people read from top to bottom left to right I always like to align my photos to the right of the content. This puts a lot more empathy for the reader on the content itself and then uses the photos assistance for your overall content. If you were to put your picture on the left-hand side, that’s the first thing that people see. It can lose the importance of what you’re trying to say always use an explicit CTA. That’s a Call To Action because it’s great if people are coming to your site but all the traffic in the world doesn’t matter if no one’s buying from you. Finally, use conversational tone you always want to use “You” and “I” instead of having a third-party or a third-person view. Making your content as personal as possible is essential, and third-person terms make your content less own. Your startup needs to rely on that personal connection that you have with your customers because you know their needs and that’s why you launched your startup. Some of the best tools to use here are SEMrush, Ahrefs, and LSI Graph. I’m going to put a link to both of those below in the description so that you can easily find those and also some other links to help out with your continued research. Thanks a lot for your time today and taking a look through the best startup copywriting tips again feel free if you have any questions to email me at [email protected]. If you could go ahead and leave a like on the video as well as subscribe and leave a comment below with any questions or any ideas that you have. I’d love to hear your startup marketing strategy and your approach to creating excellent content for your business. Until the next video, we look forward to on how to improve your small business or startup in today’s online world!